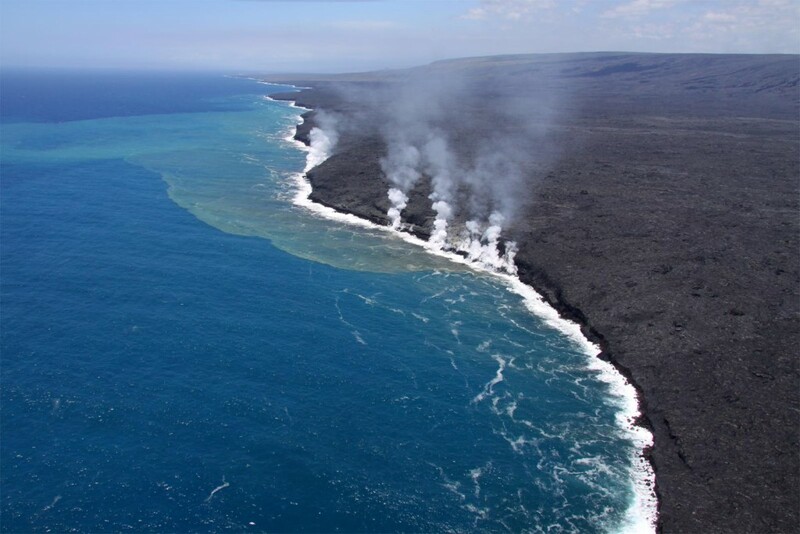 A recent shot from the Hawaiian Volcano Observatory shows the dramatic event that has unfolded daily for decades now along the southern coast of Hawaii–lava covers existing land and creates new coastline, heating the ocean and venting gases. The water turns a blue-green shade, filled with new earth and gases like sulfur dioxide. Some have taken to boating or even paddling out into these waters for close up vantage points of the earth building process, forcing the USGS and National Parks Service to issue reminder warnings that doing so is unsafe. Although we are sure paddling through hot water is a thrill, we will enjoy the view from the helicopter. Just behind this point of view are the few remaining homes and structures in the Kalapana Gardens subdivision.